Pony-sized mare Placement claimed her second win, and first in town, from 28 starts at Sandown on Saturday following a succession of minor placings. The four-year-old appreciated the light weight (51.5kg) after the claim for apprentice Katelyn Mallyon and darted through a gap late to win in a blanket finish. The Savabeel four-year-old was Group 1 placed as a maiden in the 2010 VRC Oaks (2500m) after running second in the Group 2 Wakeful Stakes (2000m) and the Listed Sportingbet Stakes (2000m). 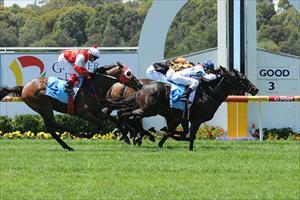 She also ran sixth in last year's SAJC Australasian Oaks (2000m) and ninth in the AJC Oaks (2400m). The Danny O'Brien-trained mare's first win didn't come until August last year when she narrowly won a Geelong 1300m fillies and mares maiden. Placement has lived up to her name on 13 occasions including her past three starts at Flemington and Saturday's Greater Dandenong Chamber Of Commerce Hcp (2100m) win took her prize money to more than $300,000. Mallyon had the mare up running second on settling but let her drift back as the race progressed. "I had a nice run on her down the back and she switched off lovely," Mallyon said. "When I asked for her when she saw a bit of daylight she had the last crack at them and she was too good. "I know she's had a lot of placings but I think she does try. "Her last couple of runs had been really good and she's very fit now and she was too good." Foreman Paul Hazlett said Placement appreciated her light weight. "The light weight against the boys suited her. She's not that big she's only a pony," he said. "She's been going well and the fact Katelyn had ridden her at her past two starts helped her too. "She's not hard to ride but she (Mallyon) knows her now. "We'll just chip away with her and see what else we can find."